In order to repay VeryPDF old customer support, VeryPDF Software Company gives 30% discount for all the newly developed software to the old friends. I will list all the newly produced software here and all of them allows you to have free trail. After trying, if you feel it is good, please show us your order ID which begins with letter U or E then we will give the discount link to you. Pay it from the discount link, the code will be sent to your email box automatically. 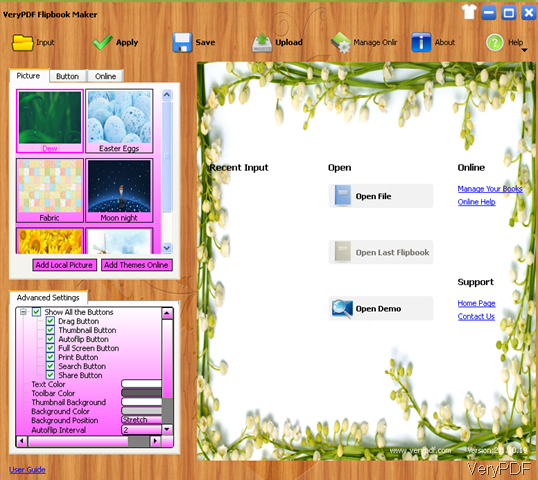 By this software, you can generate flipbooks which can be viewed on PC, Mac, iPad, iPhone and other mobile devices.The flipbooks can be made from all the printable files like, PDF, Office files (Word, Excel, PowerPoint, etc. ), HTML webpages and images. After making, you can save the flipbooks locally or upload it to your private account on the VeryPDF sever. After uploading, there will be embedded code produced which allows you to embed the flipbooks into your blog or the website. The following snapshot is from this software interface. If want to check the embedded effect, please read this article. Now it only charges 40$. This software is developed for compressing PDF files. It not only can reduce the size of images in a PDF file by down sampling and compressing but also compress and subset the fonts used in the PDF by embedding. Besides compressing PDF, it can edit the description of PDF and protect the PDF with passwords. It also can convert PDF file to PDF/a. Now it only charges 20$. The following snapshot is from PDF Compressor software interface. This software can be used both under Windows and Mac. I can not show details of all the newly developed software here, so I put theirs names and homepage here for you to check. When you need to buy, only show us your order ID and the full name of the software then we will give the discount link to you. All the software we listed above can be given 30% discount for the old customer. And the discount activity will end till 2012-12-1. During the trying, if you have any question, please contact us by the ways supported on our contact us website. This entry was posted in @VeryPDF News and tagged discount. Bookmark the permalink.